Dave Noda is the President, Co-Owner, and Chief Operating Officer of Vision Quest Coaching. Dave’s first encounter with Vision Quest came in 2005 as a triathlete, but after just a ‘taste’ of Vision Quest, he was hooked on the philosophy, training programs, and personalized instruction around which Robbie organized the VQ family. Dave is now an integral part of that same family. With his quick wit, athletic talent, modesty, and magnetic personality, Dave makes new and current athletes at Vision Quest feel that they are a part of something great. As Director of Operations and Director of Good News, Dave was (and still is) responsible for the daily operations of Vision Quest’s facilities, training camps across the country (Solvang and Santa Rosa, CA and another in UT), Ironman-distance training rides, indoor and outdoor rides, and — along with Robbie – being the ‘go-to-guy’ for current and new Vision Quest athletes. He also has been the catalyst for programs that have reshaped the way Vision Quest reaches out to new athletes. While Dave is still actively involved in the operations, his responsibilities now extend beyond Vision Quest’s daily workings. Prior to joining Vision Quest’s business side, Dave worked in the mortgage industry as a loan officer and was himself the owner of a mortgage company. He stayed in that business from 1998 through 2005. Dave also spent several years honing his mental and physical toughness in the United States Marines Corps where he served his country for six years. His athletic accomplishments are many. Dave has completed three Ironman triathlons and competed competitively in several shorter distance triathlons, including the Triple T, Spirit of Racine, Steelhead 70.3, and the Galena Triathlon. He also qualified for and competed in the national championship for olympic distance triathlon in Portland, OR. While he began his athletic career with Robbie as a triathlete, he’s become a strong cyclist as well. His cycling accolades include the CAF million dollar challenge, which covered 620 miles from San Francisco to San Diego, Race the Lake, and numerous time trials. In addition to these cycling and triathlon feats, Dave is a certified USA Cycling Coach (Level III) and has a USAT Level I Certification. 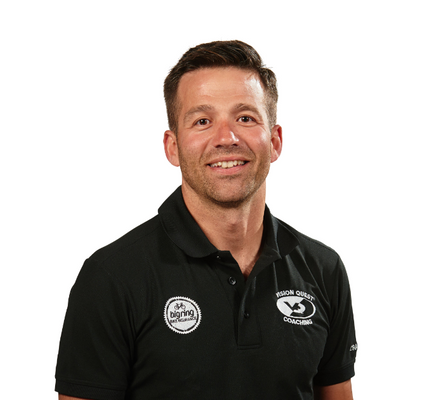 To stay on top of the best training techniques, Dave also regularly interacts with experts and vetted coaches who pass on their ideas to him and his fellow coaches. When Dave is not at Vision Quest or cheering on athletes at an event, he is spending time with his wife, Deanna, and their two children.